On the heels of last year's monumental, first-of-its-kind event, Course of the Force, the lightsaber run that captivated the attention of Star Wars™ fans around the world, is returning July 9th – 16th, 2013. Kicking off at the famed Skywalker Ranch, participants will continue the relay run down through San Francisco with several stops along the California coastline before reaching the finish line— arriving just in time for the start of the 2013 San Diego Comic-Con® International convention. Nerdist Industries' founder Chris Hardwick will be back to host the event, with city-stops along the way featuring "Conivals" where fans can celebrate their love of the Saga with live entertainment, expo booths, giveaways and much more. "Our plan to run at Comic-Con screaming with a lightsaber worked beyond our wildest dreams. People showed up! Lots of them! In cosplay! And we were able to grant more than 1000 wishes for Make-A-Wish!" said Chris Hardwick . "Last year we started in Santa Monica, this year, Marin, and hopefully next year Tatooine." Course of the Force has reteamed with the Make-A-Wish Foundation® chapters of Greater Bay, Los Angeles, Orange County, and San Diego with 100 percent of all runner registration proceeds benefiting the charity. In 2012, the Make-A-Wish Foundation® had a strong presence during the inaugural event, with Make-A-Wish kids participating in the opening and closing ceremonies of Course of the Force and running in the event. Given the overwhelming response to the 2012 relay, this year's event is expanding and will cover nearly 500 miles; at the end of the route, Course of the Force will be hosting activities at the Chuck Jones Gallery in San Diego during San Diego Comic-Con International from July 18th - 20th. 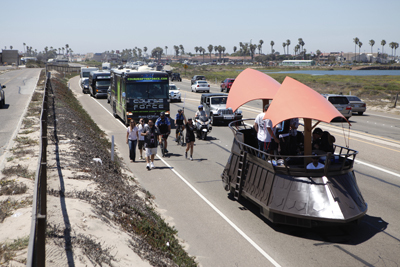 Highlights from last year's 136-mile Course of the Force lightsaber run featured a caravan of costumed runners, Jabba the Hutt's Sail Barge and two Yoda-fied RVs traveling down the Pacific Coast Highway. In addition to helping grant wishes, participants of Course of the Force will run quarter-mile segments down the California coast, passing off the official Course of the Force lightsaber. Each relay spot is $150, which includes a customized Hasbro lightsaber, exclusive Course of the Force swag bag and the experience of a lifetime. Runners are encouraged to be creative and wear their best Star Wars gear.